When you arrive at the effervescent Mercado Central de Cádiz you know you’re near a serious seafood port. The stately white, block-long mercado building, whose 19th century arched windows brighten several aisles of food stalls, has recently been refurbished. 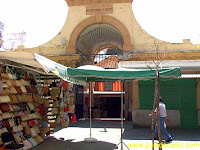 The Spanish government is on a happy campaign to support traditional markets, many of which are of historical importance, by restoring them and promoting their accessibility; the side benefit of this trend is to foment old-fashioned ways of purveying foodstuffs. Old markets are busier than ever, as demanding European shoppers seek out the best, freshest ingredients from local farmers and fishermen. With its winding, crooked streets, inviting, well-preserved plazas, and lots of cool bars and peña clubs (where Flamenco is performed on weekends), the port of Cádiz is a city that looks inward, with no waterfront, no malecón. But you don’t get to the essence of a place until you see what the residents eat and where they shop. And in Cádiz you are, without a doubt, in a fish town. I recently visited this teeming agora of gastronomic activity on a crisp November morning. 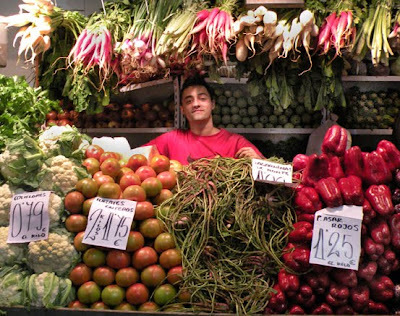 Stands proffered typical Mediterranean fruits and vegetables in tall, exuberant formations. Regal, gleaming, purple eggplants were piled next to crisp, frilly fennels and ruby colored tomatoes, which practically burst through their skins. Citrus of every size perfumed the air. 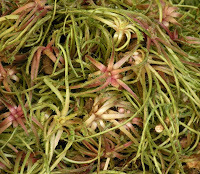 A curious curly green vegetable called tagarninas, related to the artichoke, was featured as its fleeting season was in full force. Alas, I learned, you have to be invited to someone’s home to sample this exotic delicacy—it doesn’t show up on restaurant menus. I pleaded with Sra. Gómez, a stout, austerely dressed shopper who seemed straight out of a Garcia Lorca play and knew the recipe, to have me over, provoking gales of laughter, but I didn’t snag the invite. My consolation was some early dessert at one of the churro stands that line one wall outside the market building. But it was the fish purveyors that really blew me away. An incredible bounty of glistening seafood attracts throngs of shoppers of all ages and classes. There’s shellfish in all shapes and sizes - navajas (razor clams) so alive they slither daringly in and out of their shells to peek at the customers. Fish so fresh they seem to shimmy like Egyptian belly dancers. 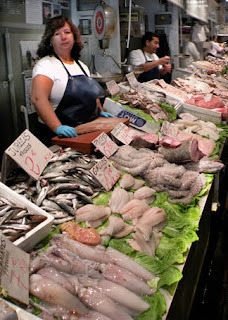 The variety and freshness of the catch makes this one of the most visually exciting markets in Europe, an inspiration to any chef, pro or would be. 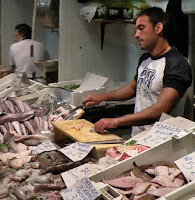 And then there are vendors themselves: many of them well-built, swarthy guys, fishmonger versions of Antonio Banderas (and I attribute their healthfulness to eating well and good genes). It was all a reminder of why I love markets. I could have stayed all day, listening to the ebullient hawking and haggling. But my stomach got the best of me and I decided to do something I like even more: go eat lunch. As you speak, I can taste!!!!! !